Yesterday Lotta Engberg has made big present for us inviting artists we love especially - Malena Ernman, The Poodles, Pauline, Christoffer Hiding and Swingfly. How can we categorize them all? You wouldn't expect any of them to appear at Melodifestivalen but they were there and succeeded quite well (probably Pauline not so much but still Andra Chansen is someting). 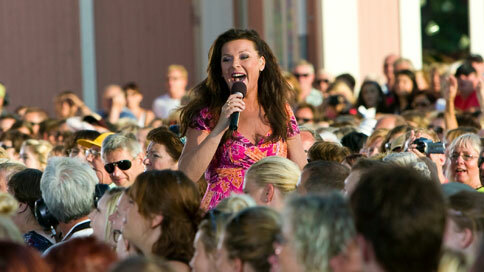 Malena was singing her biggest hit "La Voix" and fresh single "I det Fria", Swingfly performed his latest singles "Me and my drum" with Christoffer Hiding (receiving absolutely fantastic public reaction - you could expect it at least won Melodifestivalen) and Pauline has joined guys for "Little did I know". The Poodles were performing acoustic versions of their classic hit "Night of passion" and new single "Cuts like a knife", Evert Taube's "Änglamark" and "Skönheten och odjuret" together with Malena. Another guest of the show was Talang-2011 patricipant Rasmus Eriksson with "Änglahund" and his ows song "Cowboy superstar". Watch whole episode here and best pieces below.